Xing Yi (or called Hsing I, Body-Mind Boxing) is an internal martial art very popular in China from the day it got created. It has an important place in the history of Chinese martial arts since its unique characteristics. Xing Yi as a well-developed system was created based on Xin-Yi(Heart-Mind Boxing) through fundamental evolution, such as Stance, basic movements and special quick-pace training method. 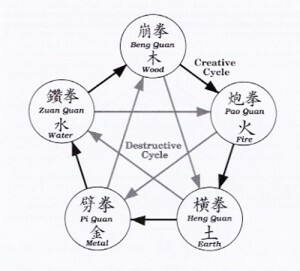 These changes ensure that people will get maximum martial result in the comparatively short period of time of practice.This style emphasizes the unity of internal and external as one in order to make body generate power for combat; Xing means the body, the external aspect or animal movement parts, and Yi means Mind, the internal aspect or Five-Element part. In Chinese martial art community, Xing Yi has been a dominating style for more than one century. For example, at the national full contact competition which happened in the 1930s, most of the best fighters were from Xing Yi school, or Hebei school.This style does not have any fancy movements, instead of, Xing Yi focus on internal power training and real-situation application. For health purposes, Statistics show that Xing Yi practitioners tend to live longer than other styles’ people, Although this style will not emphasizes the health benefits but people will live longer since the internal power make practitioner stronger and healthier. In China, there is a proverb that “Xing Yi does not play games.”or “you can not go out the door with Tai Chi before doing it for 10 years but you can see huge self defense benefits from Xing Yi in 3 years practice. If you want to be healthy and live to one hundred, do qigong. Qigong is the art and science of refining and cultivating internal energy. Think of the circular path of each movement, in Tai Chi every movement is in curve or circle that has no ending or beginning.